In many ways, “Elektra” is the perfect opera. With its roots in an ancient Greek tragedy by Sophocles, but with a stunning, demonically difficult score by Richard Strauss and librettist Hugo von Hofmannsthal steeped in the feverish modern expressionist poetry of the early 20th century, it blasts its way into the darkest emotions and most ritualistic impulses of a powerful family that has run amok. And during the course of its uninterrupted 100 minutes it conjures the sort of love, hate, fear, rage, alienation and quest for bloody vengeance that is the very reason for opera’s existence. Lyric Opera’s production of “Elektra,” last seen here in 2012, has found its ideal cast this time around with singers whose spectacular, powerhouse voices are matched by superb acting skills. Originally directed by Sir David McVicar, this revival – with its monumental but treacherous architectural set by John Macfarlane – clearly thrives on the skills of Nick Sandys, the longtime artistic director of Chicago’s Remy Bumppo Theatre and a fight and movement director for Lyric. He has turned every scene into a play rather than a presentational vocal exercise. And talk about female power. The opera is driven by three ferociously difficult roles for women, all played to spectacular effect, with Nina Stemme, the Swedish soprano, in an extraordinary Lyric debut as a galvanic Elektra; Elza van den Heever, the high-flying South African soprano, as her sister, Chrysothemis; and American mezzo-soprano Michaela Martens, as their mother, Queen Klytamnestra. Each has defined these larger-than-life forces of nature with unabashed passion. And the women are ideally complemented by those playing the crucial but smaller male roles of Orest, Elektra’s beloved brother (Scottish bass-baritone Iain Paterson), and the debauched Aegisthus (American tenor Robert Brubaker) who, with Klytamnastra, murdered King Agamemnon, the siblings’ father, and usurped the throne. The backdrop for all this calamity is the massive and forbidding stone palace of Agamemnon which looks as if it has just been upended in an earthquake, and whose steep, tilted staircase leads to a courtyard where a deep pit suggests a giant, open grave. The kingdom clearly is in a state of upheaval, with Elektra, an outcast feared by the powers that be, churning with resentment. 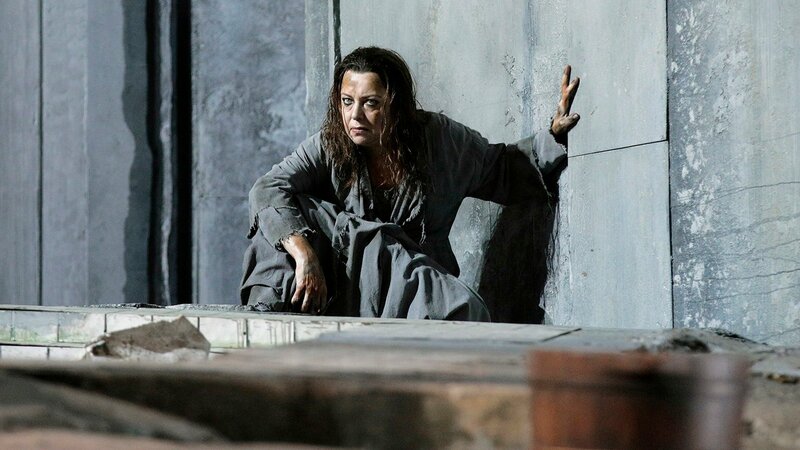 And in an extended aria delivered brilliantly by Stemme (whose frenzied movement only adds to its impact), she makes it clear that she is hel-lbent on avenging her father and setting his soul at peace. Their mother, Klytamnestra, is envisioned as a grotesque and fearful creature (Macfarlane has costumed her in a massive gown that exposes giant, bare, prosthetic breasts), and one possessed by intimations of mortality. But Martens and Stemme also join in a vividly realized scene in which a vestige of the mother-daughter bond, as profoundly fractured as it might be, can still be sensed. Stemme also has a riveting “recognition scene” with Orest, who has been in exile, and who Elektra believes has been murdered. And Paterson brings an ideally measured tone to their encounter before fulfilling the brutal destiny his sister has prepared him to live out. There will be blood, a lot of it. Along with the singers (and many expertly limned turns in supporting roles, including Ann Toomey, recently seen as Musetta in “La Boheme,” as a maid who dares to support Elektra), there is masterful work by conductor Donald Runnicles and the Lyric Opera Orchestra. What we know about the ancient Greek theater, and its performances in great stone outdoor theaters, is that it had all-male casts, with masked solo players and a chanting chorus. In this operatic take on “Elektra,” the women are the electrifying forces, and they set the stage on fire. The remaining performances of Lyric Opera’s production of “Elektra” are Feb. 10 at 2 p.m. and Feb. 14, 18 and 22 at 7 p.m. at the Civic Opera House, 20 N. Wacker Drive. For tickets ($39-$279), call (312) 827-5600 or visit www.lyricopera.org. Running time is 1 hour and 40 minutes with no intermission.